With the summer-like weather in New York today, this is the perfect recipe for the moment. If you need something to eat and you don’t want to heat up your kitchen — bingo. This is delicious and satisfying–it’s an awesome pasta salad with meat plus crunch from almonds and salty capers, all in a lettuce bowl. I love that the recipe calls for red and yellow pepper — I’m a huge fan of these over green. You get great flavor but it’s sweeter and less harsh than green peppers. This is a perfect meal for a picnic in the park or to take to the beach. Cool and refreshing! If you don’t feel like dirtying a blender, put the dressing in a Tupperware and shake it up to blend it. Per above, don’t substitute green peppers. Worth it to pay a bit extra for the yellow, orange or red variety. I cut the Parmesan into thick slices versus grating it, for more flavor. Cook pasta al dente, according to package directions. Drain, set aside, and allow to cool. In a large mixing bowl, toss together chicken, almonds, peppers, onion, parsley, and capers. Stir in pasta and enough vinaigrette to lightly coat. Add salt and pepper to taste. Refrigerate salad until you are ready to serve. Then, place 1 lettuce cup on a small plate and fill with chicken salad. 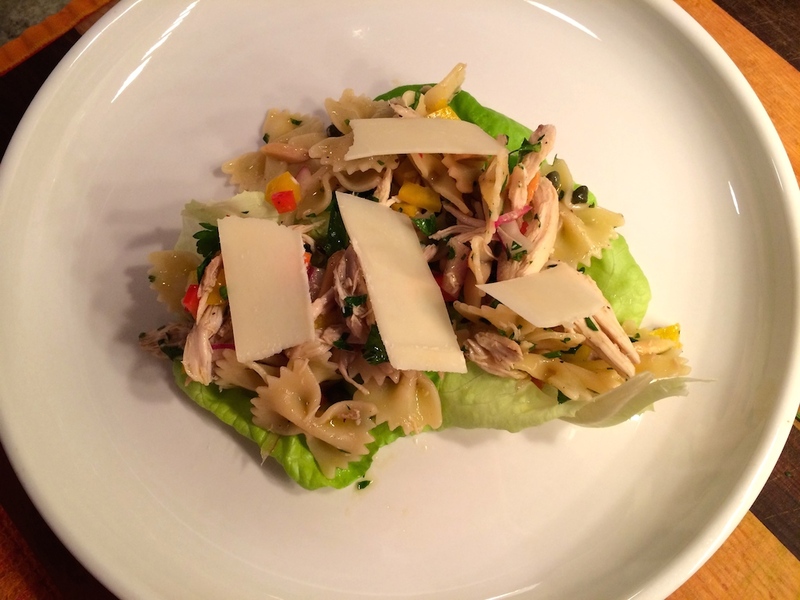 Drizzle with additional vinaigrette, if desired, garnish with shaved parmesan, and serve. Combine the vinegar, lemon juice, honey, salt, and pepper in a blender. Gradually add the oil while blending and blend until emulsified. Be sure to stir the mixture prior to using! 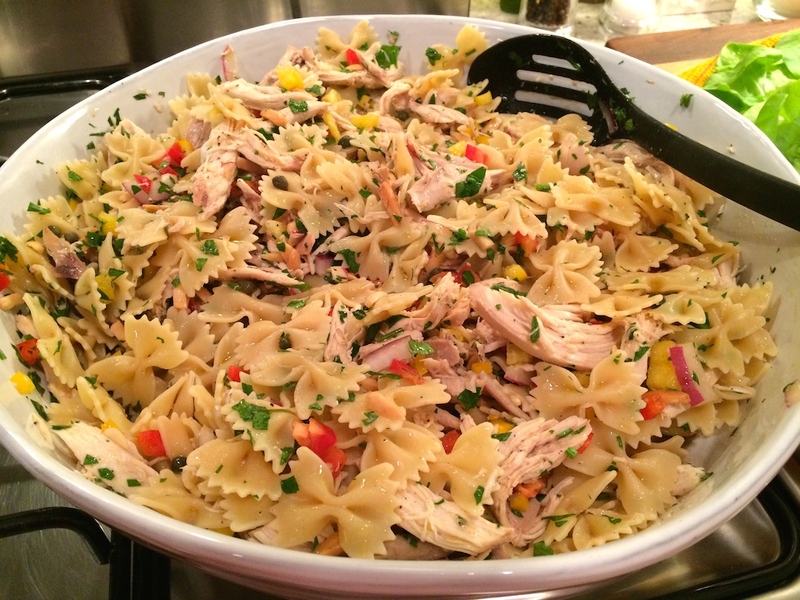 This entry was posted in Recipes and tagged chicken, meals for hot weather, pasta salad, rotisserie chicken by Tricia. Bookmark the permalink. I’m from NY too! These look much fancier than my lettuce wraps- they’re always a mess. If you’re interested, I’d love for you to share a post in my blog link up tomorrow. It’s a great way to network with other bloggers and share content. I wrote a brief explanation up on my main menu under ‘Tell Em Tuesdays’. I hope you’ll join in!